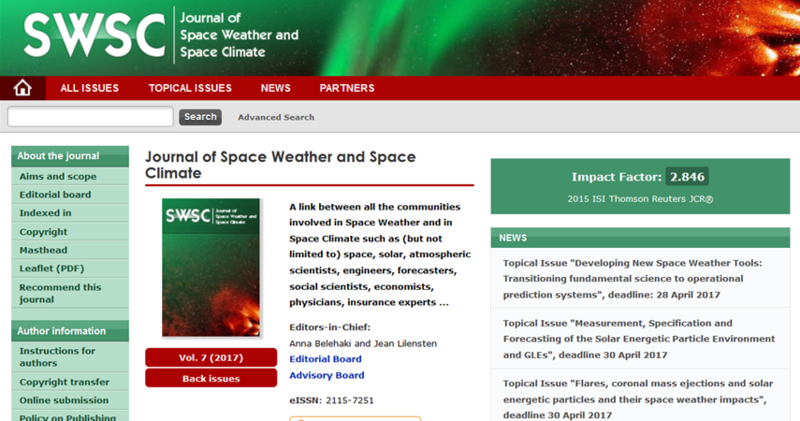 Benefiting from the highly successful ESWW13, the open-access Journal of Space Weather and Space Climate (SWSC) has opened three topical issues (TI), as listed underneath. Questions regarding these topical issues are to be addressed to the respective topical editors-in-chief. For questions concerning the submission process, please contact the Editorial Office. Manuscripts have be submitted in PDF format via the SWSC online submission tool before the respective deadlines. These topical issue are completely open to all contributors, i.e. they are NOT limited to ESWW13 conference participants.